Twenty-fourth class for new ringer Barbara. Focus was on lowering. She raised and lowered the 2 several times, raising to just beyond the first coil and lowering again for extra practice on taking a coil. She also worked on setting the bell at each stroke. Her work on her stance and keeping the tail on her side of the sally has taken care of both those issues. Barbara will come to next Tuesday’s practice to work on ringing in rounds. Next class for Barbara and presumably Eoin is We 2 May. Next class for Carroll and Nancy is Tu 1 May. Five ringers: Jody, Judy, Marguerite, Pamela, Thomas. We rang 12345 (F-E-D-C-B♭). Plain Bob Minimus with tenor behind. Raising and Lowering is a new video in the Miami Guild of Change Ringers YouTube channel (miamibells). It shows what happens when a ringer raises and lowers a bell, both in the ringing chamber and upstairs in the bell chamber. It is intended for our new ringers who are working on raising and lowering. Twenty-third class for new ringer Barbara, and twenty-second for new ringer Eoin. Note that due to their schedule nearly all these learners’ classes have been half-an-hour each, so they are roughly at the eleven-hour level. Today the focus was on lowering. Each ringer raised and lowered at least twice. They will work on smoothly crawling up and down the tail, and on taking coils, at home with the practice rope. Right foot half-a-foot ahead of left foot. Stand close enough to the rope (it makes control easier). At the catch, the tail goes on the ringer’s side of the sally. Next class for Barbara and Eoin is Su 29 Apr. Next class for Carroll and Nancy is Fr 27 Apr. 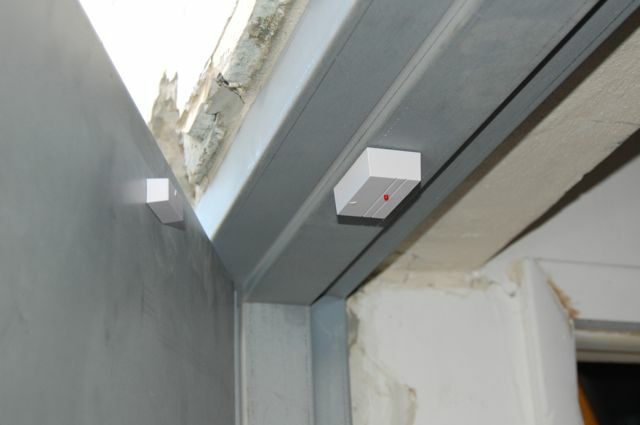 The door sensor has been installed on the new door, and the chime is sounding again. Also, a strip of weatherstrip was added to the door frame to keep it from slamming. Four ringers: Judy, Ken, Pamela, Thomas. Rang on 1234 (F-E-D-C). You have to work to place your blows accurately, especially with only four bells. When hunting in, you’ll probably need to move up the tail; then back down the tail to the rounds position to ring the second blow at rounds speed; then further down to hold up for hunting-out speed. It works much better to think a stroke ahead (that doesn’t mean it comes naturally, just that it works much better): before slowing down, it’s essential to pull the preceding stroke with extra oomph (because you can’t push a rope up), and before speeding up, pull the preceding stroke with less oomph so you don’t have to check heavily. You can’t ring accurately by just counting your place in the compass (though you do need to count your place). You have to combine counting with either looking at the ringer you are following, or expert listening. Looking has the additional advantage that it helps the ringers around you. Learn to look in the coursing order, which for Plain Hunt on Four is 2-4-3-1. You don’t have to be thinking “thirds over the treble, seconds over the 2, …” but it is really helpful to look at the treble, look at the 2, … , and the visual pattern is quite simple. After practice the ringers adjourned to a pub. Twenty-fourth class for new ringer Carroll. She needs to progress a bit faster if possible; it’s time for both these new ringers to graduate. Today’s focus was on cleaning up items noted by the visiting ringers. Carroll made progress on getting all ten fingers around the sally, rather than leaving her left ring and little fingers around the tail only for a feeling of security. Seventeenth class for new ringer Nancy. She raised the 6 and did well. One of the items noted by the visitors was foot placement; Nancy tried keeping her right foot forward. The focus was primarily on follow-through, especially after the handstroke. She got it exactly right roughly a dozen times during the hour, but the rest of the time did not follow through and/or did not get her right hand atop her left for a clean pickup. Next class for Carroll and Nancy is tentatively Fr 27 Apr. Next class for Barbara and Eoin is We 26 Apr.